CT Slice: What's the Score With CCS? Enthusiasm is building around CT's ability to show coronary artery calcium (CAC) and the consequent role it can play in preventing heart attack and sudden death. Such findings can motivate patients to take prescribed heart medications and make necessary lifestyle changes, the theory goes. However, the procedure's use is a possible vulnerability that could hold back its potential as a life-saving screening tool, according to key supporters. Ethics question arise when doctors use a coronary calcium score (CCS) to persuade patients to receive further testing or procedures that they do not need, says Matt Janik, MD, FACC, a preventive cardiologist and founder of Your Heart Report, a company dedicated to growing the appropriate use of CCS. "Fear of misuse has led many societies and individuals to downplay the efficacy of CCS as a screening tool," Janik says. According to Janik, CCS provides the most accurate and specific assessment of heart attack risk for asymptomatic patients. Other risk calculators, in comparison, "are fairly accurate, on average, for groups of people but misclassify individuals more often than not," he says. Risk calculators such as the atherosclerotic cardiovascular disease calculator developed by the American College of Cardiology (ACC) and the American Heart Association (AHA) are designed to put patients into low-, intermediate-, or high-risk categories. "A person deemed to be at intermediate risk by the calculator is truly low risk one-third of the time and high risk another one-third of the time. It matters a great deal to those individuals what their true risk is," Janik says. "Treating the average just doesn't make good clinical sense. We need to target therapies for people who are truly at significant risk of heart attack." Most importantly, CCS should be used to provide patients with a "very clear sense of where they are as far as their cardiovascular risk" and help determine the most appropriate treatment, Janik says. "Most prevention-focused doctors are ethical in the way we apply CCS in practice. Rather than using CCS as a way to drive utilization of stress testing and keep the heart catheterization lab busy, we instead focus on getting at-risk people to quit smoking, exercise, and start a statin right when they start forming plaque," he says. "I don't want low-risk people to be put through a CT that they don't need, and I don't want everyone who has a little plaque to become fearful of future events and put through a stress test." Appropriate treatment for those whose CCS finds them to be at intermediate or high risk involves making lifestyle changes such as losing weight, exercising, and quitting smoking—recommendations those at all risk levels should heed. Treatment for those with significant plaque on CT should also be prescribed a statin. With many people looking to avoid medications in favor of natural therapies, CCS can improve patient buy-in of statin use, Janik says. "When I show patients that they have significant plaque in their heart arteries and a high score, they are suddenly excited to take a medication which can stop or reverse plaque," he says. "People are equally elated when they receive a zero score and I tell them that they can safely avoid cholesterol medications for another five to 10 years." The potential for unethical use may be one reason why some societies, professionals, and insurance companies are not backing the routine use of CCS despite its proven benefits, Janik says. "Oftentimes, those who write our guidelines and talk about this nationally and write editorials have not seen firsthand how a skilled clinician can incorporate CCS to benefit patients. Most of us are sincerely interested in saving lives, not profiteering," he says. To further explain how CCS, when used appropriately, can contribute to a personalized prevention plan, Janik has authored a patient guide, "Get More From Your Score: How to Use Cardiac Calcium Scoring to Prevent YOUR First Heart Attack!" The Society of Cardiovascular Computed Tomography (SCCT) also promotes the benefits of CAC scoring and the importance of its proper use. "There is a significant amount of data validated in multiple prospective cohorts that includes both genders, multiple ethnicities, and even younger patient populations that supports the use of CAC scoring in risk assessment," says society representative Emilio Fentanes, MD, of the San Antonio Military Medical Center. "We must ensure that the test is used in the proper clinical setting and for the right patient population." According to the SCCT, CAC scoring should be considered only in adults aged 40 to 70 and should be repeated at least five years after the initial test for those with an initial CAC of 0. The SCCT plans to release new CAC scoring guidelines this year. "The role of CAC scoring in risk assessment has not been incorporated into the mainstream of clinical cardiology, and it is our hope these guidelines will provide more clinicians the information they need to use this test to individualize their patient's risk assessment," Fentanes says. Radiology professionals who perform chest CT will benefit from the new guidelines, which require the presence and extent of CAC to be included in every chest CT report, including those taken for lung screening. "The vast numbers of patients who undergo chest CT scans will now have the most important tool for risk assessment provided to their physicians at no extra cost or radiation," says Harvey Hecht, MD, a cardiologist at Mount Sinai Hospital. "The key step is for the physician to act on this information and inform the patient of his or her risk status and the appropriate steps." 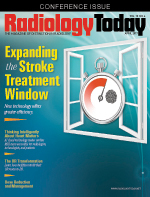 Radiologists have a role in reporting the chest scan's CAC information, including the standard recommendation based on the CAC level, says Hecht, whose report "2016 SCCT/Society of Thoracic Radiology Guidelines for Coronary Artery Calcium Scoring of Noncontrast Noncardiac Chest CT Scans" ran in the January-February 2017 issue of the Journal of Cardiovascular Computed Tomography. The SCCT also is making an effort to get CAC scoring covered by insurance. "While coverage for coronary calcium score is not uniform across the nation, some large insurers such as Aetna provide coverage for defined patient populations," Fentanes says. "In addition, we see increased interest among states to mandate coverage of calcium score for select populations by all insurers doing business in the state." Michael Blaha, MD, MPH, says other societies and radiologists should join the campaign for CAC coverage, as well as educating others, ensuring appropriate CAC pricing, and reporting incidental findings responsibly. In the February issue of the Journal of the American College of Cardiology, he voiced disappointment over the ACC/AHA's most recent (2013) CAC recommendation. In that article, "Cardiovascular Imaging: Coronary Artery Calcium Need for More Clarity in Guidelines," the ACC and AHA gave CAC "a relatively weak 'consider' recommendation" of IIb. "This is particularly disappointing because CAC received a IIa recommendation [strongly consider] in 2010," according to Blaha. In the organization's defense, ACC spokesperson Donald M. Lloyd-Jones, MD, ScM, FACC, FAHA, says the ACC's 2013 recommendation was based on a "stringent" review of evidence available at the time and that newer evidence will most likely result in a more favorable update. "The ability of CAC to add value under the new guidelines was unknown. Now, in 2017, we probably have enough evidence to change the paradigm in a way that will incorporate disease screening, likely using CAC since it has the best evidence base," Lloyd-Jones says. "ACC and AHA are looking to convene a new risk assessment guideline in part to address this."